The Mighty Quest For Epic Loot is Ubisoft Montreal’s first free-to-play game and one that dares to bring something new to the table. Featuring a humoristic cartoon look and ingenious gameplay, this is a game of two very solid halves that beautifully complement themselves. The goal in the game is to conquer as many castles as possible while keeping ours safe from enemies. The two phases are looting and defense. In the first the player enters Diablo-style gameplay with one of the characters available (knight, mage and archer at the time of writing) and tries to loot the treasure rooms of enemy castles, defeating several creatures and overcoming traps in the process. 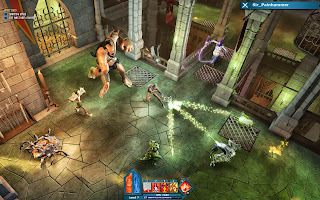 In the defense phase the player has to set up traps in a Dungeon Keeper style, arranging the castle layout and filling it with several deadly creatures and traps. The Mighty Quest For Epic Loot is a very original, compelling and funny game that has a very addictive competitive side to it. Currently in closed beta. First open beta phase runs from July 2nd to July 5th, so sign up now!